Pancake is a walking talking goofball. If you are lucky enough to have him as your instructor, be ready to laugh! First Jump: 1995 Long Island, NY, static line. Little Known Fact: Pancake (yes, it’s his real last name) never drank beer at all until he had his first cutaway, and had to buy a case of beer. We don’t believe him, but that’s what he says. He’s also learning conversational Klingon (Now that sounds kind of like him). Pancake was born and raised on Long Island, NY. He was, correction, is, a studious nerdy type. He never skipped a class, played bass trombone, was on the tennis team, and was always very interested in film and heights. As a teen you may have found him standing on a window ledge filming small “Super 8”-like movies. After high school, Pancake went to Suny Purchase Film School. He worked as a gaffer, cinematographer, and best boy in Manhattan. He did work for two seasons of Amy Poehler’s “Upright Citizens Brigade” in pre-SNL days. Even though Pancake loved film, his eyes were always turned skyward. Taking a flight lesson at the age of 15 and taxiing a 747 at JFK (his dad had hookups with Pan Am Airlines) sparked his interest in aviation. He got his skydiving license through static line progression and just never stopped jumping. 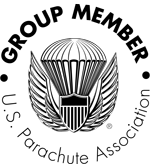 Pancake is now a Tandem Instructor and Examiner, AFF Instructor, Coach Examiner, videographer, and a Master Rigger. He also has his private pilot’s license. Running Jumpfish Rigging loft is a full time job on its own, but he still takes the time to jump as well. Pancake is well known for being a practical joker. One of his best was convincing at least half of the dropzone that he was leaving the sport for good after his favorite boogie in Puerto Rico. He also did an entire tandem briefing with an ace bandage and crutches just for fun, and strangely, no one questioned him. It is also safe to say that Pancake is THE most photographed person on the entire dropzone. We have photos of him sporting every hairstyle known to man from bald to below his shoulders and creative party costumes up the wazoo. The best part of his costumes is that he NEVER breaks character. If you haven’t had the pleasure of meeting Pancake yet, you should try to grab him for a jump, just show up at his house with beer, bathing suit (optional), or go bother him in the loft. He also likes Tuaca!